Desalination is considered a solution to increasing water shortage in the world. A few functional desalination plants in Tamil Nadu, however, show a different picture. Population growth estimates suggest that India will be supporting over 1.5 billion inhabitants by 2050 if the present growth rate of 1.9 percent per year continues. From 710 billion cubic metres (BCM) in 2010, the demand for water is expected to surge ahead to 1180 BCM in 2050 as the Planning Commission has predicted a 2.5-time increase in domestic and industrial consumption. With conventional surface water sources drying up or disappearing over time and borewells getting deeper by the year, sourcing and supplying water have become uphill tasks for corporations and panchayats across urban and rural areas. It is at such a time that seawater desalination is diligently emerging as one of the top alternatives. But the most important question is, is it a viable one? Desalination technology has grown and matured by leaps and bounds over the years. Seawater Reverse Osmosis (SWRO) technology, developed by US scientists in the 1950s was a game changer of sorts. Osmosis is a naturally occurring phenomenon where the solvent (the substance in which other materials remain dissolved) moves from a region of lower concentration to that of a higher concentration through a semipermeable membrane to equalise the solution’s overall concentration. Reverse osmosis (RO) does the opposite. RO is essentially a pressure-driven process where a semi-permeable membrane is used to separate suspended and dissolved solids from water. In SWRO, seawater is forced through the membranes under high pressure so as to enable the movement of water (minus the suspended and dissolved solids) to one side while the pressurised side retains the salts and ions. Prior to subjecting seawater to RO, the incoming water is treated to decrease turbidity by removing the suspended solids. Highly saline seawater with a concentration of total dissolved solids (TDS) close to 35,000 ppm (parts per million) is converted into the potable quality water with a TDS of 200-500 ppm. As the process strips the water of all its hardness and alkalinity, carbon dioxide and lime are added to stabilise the water. Chlorine-based disinfection is usually carried out to remove microorganisms before supplying to consumers. According to the International Desalination Association (IDA), there are around 18,426 desalination plants spread across 150 countries, benefitting as many as 300 million people. Nearly half of Israel’s water is manufactured and many countries, especially in the arid regions of Northern Africa and the Middle East, find desalination a relatively cheaper option compared to other alternatives. Among the early adopters of the ambitious technology, Tamil Nadu currently boasts of two functional desalination plants churning out 200 million litres of water per day (MLD) to quench its capital’s thirst. Chennai is almost entirely dependent on the monsoon for its water supply, the failure of which puts the city in a tight spot. The state government, back in 2003-04, decided to go in for desalination to augment municipal water supply. The two 100 MLD plants, one in Minjur and the other in Nemmeli, now contribute close to one-third of the city’s total water supply. Sustained governmental support has enabled Tamil Nadu to contribute 24 percent of the total desalinated water capacity in India, making it the second best in the country after Gujarat. Despite technological improvements and relative reduction in production costs, is it appropriate to compare a city like Chennai which receives almost three times as much rain in a year as that of Tel Aviv? The Minjur Desalination Plant, India’s largest, was set up in the village of Kattupalli along the northern fringes of Chennai city in 2010. Ever since, the plant has been supplying 100 MLD water to households in the northern suburbs of Ennore, Manali, Tiruvottiyur, Tondiarpet and Madhavaram. The second desalination plant came up at Nemmeli, about 35 km south of Chennai city along the East Coast Road. Functional since 2013, the plant supplies 100 million litres of drinking water per day mainly to the city’s southern suburbs including Sholinganallur, Neelangarai, Thoraipakkam, Thiruvanmiyur, Velachery, Taramani, Adyar and Besant Nagar. While the water demand for the Chennai city and its urban agglomeration is projected at 1560 MLD for the year 2019, the actual water supply hovers around 840 MLD, leaving a supply-demand gap of 720 MLD. To fill this void, the Chennai Metropolitan Water Supply and Sewerage Board (CMWSSB) has proposed the setting up of additional units of 150 MLD and 400 MLD as part of its phased expansion in Nemmeli. Both these plans will come up at Perur in Nemmeli village, very close to the existing facility. A staunch opponent of desalination, especially in a rain-rich location like Chennai, professor S. Janakarajan of the Madras Institute of Development Studies terms desalination as an utterly “lazy option”. “Seawater desalination was conceived as an option for providing potable water in rain-starved countries, like those in the Middle East. Chennai’s average annual rainfall is well over 1200 mm. Where is the need to go in for such an environmentally damaging and costly exercise? It should ideally be the absolute last resort, which in this case, is not,” he says. For every 100 MLD of potable water generated by the desalination plant in Minjur, the treatment unit draws in 237 MLD of seawater. Post-treatment, the briny reject is let out into the sea, around 650 m away from the shore. While documents suggest that a similar reject-discharge arrangement is in place at Nemmeli, reality appears otherwise. Back in 2013, a fact-finding team looked into allegations of environment and human rights violations arising out of the construction and operation of the Nemmeli plant. The report recorded villagers’ accusations of the desalination plant eroding the coastline and endangering their livelihoods in addition to turning the groundwater salty. From the time the plant commenced operations in 2013, villagers complained of brine reject from the plant being let out directly onto the beach and not 650 m into the sea as mentioned in the environmental clearance granted by the Ministry of Environment, Forests and Climate Change (MoEFCC). Pipelines carrying the reject water were later buried under the sand but poor maintenance led to clogging, as a result of which pools of brine reject got stagnated along the beach stretch. Even as recently as December 2016, Chennai-based Coastal Resource Centre has documented evidences of hyper-saline reject being dumped right on the beach. The situation has not changed since; concentrated brine reject continues to be let out on the beach till date. Plant officials beg to differ. They insist that the discharge from the pipes is the ultra filtration system's backwash water, which is just seawater and not brine. Brine is discharged in to the sea through a buried pipe 500 metres away from the shore at a depth of around 7 metre through a special diffuser arrangement. Already CMWSSB has contracted to reuse this backwash seawater and produce extra 10 MLD of potable water. Construction activities are in progress and will be completed by June 2017 and after which there will be no backwash water discharge on the shore," they add. Ecologist Sultan Ismail explains that the brine reject tends to create a sort of niche microhabitat with higher levels of salinity around areas where they are let out. This microhabitat creates a localised imbalance as it may not house organisms which are otherwise found in the adjoining waters, resulting in a lower organism diversity in the area. Government bodies set out to study such imbalances claim that the ocean is too big for such a small niche to actually be a troublesome entity. But the impact on marine life can be better understood by identifying where the reject water is being let out. “There are some species of fish which feed, breed and spend most part of their early life along the coast. If the hypersaline reject is let out close to the coast, the probability of these organisms being affected is rather prominent. Fish species such as sardines, mackerels and anchovies feed on planktons along the coast. When the plankton population decreases due to hypersalinity, it affects the health of fishes up the food chain which in turn affects fish diversity as well as density,” adds Ismail. In addition, high-pressure motors used to draw in water also brings in marine life forms of varying sizes despite nets placed to avoid relatively larger organisms. Fish, fry and crabs get crushed and killed in the process. Loss of income and marine resources cannot be discounted as fishermen in and around Nemmeli have observed it firsthand. Santhosh, a fisherman from Sulerikattu Kuppam recalls the ease with which they were able to fish in the sea almost 6-7 years back. “Fishing was lucrative almost throughout the year. Prawns and fish were abundant and we didn’t have to venture very far. But that is not the case today. Near-shore navigation and the use of periya valai or shore seines have become problematic ever since boulders were dumped into the sea for laying the plant’s pipelines,” Sathosh adds. In addition to wrecking local livelihoods, the plant has depleted the area’s freshwater sources. During the plant’s construction phase, groundwater was pumped out continuously to sink deep foundations. This resulted in rapid depletion of the available underground sweet water, which eventually got replaced with intruding salt water from the sea. A plant designed to produce fresh water from the sea had, in reality, abetted the conversion of the existing fresh water in the region into unpalatable salty water. The fact-finding team had noted that the CMWSSB violated coastal regulation zone notifications of 1991 and 2011 by pumping out fresh water from a CRZ area in addition to irreparably damaging the beach front. “Shallow handpumps in our villages used to yield sweet drinking water. It has all turned salty now. Panchayat water supply can be very erratic and most of us purchase drinking water for daily use. Our land and livelihoods have been compromised so that people in the city don’t go without water. But we don’t get a drop of drinking water from the plant,” complains Santhosh. The MoEFCC’s Expert Appraisal Committee (EAC) which met in January 2017 questioned the need for setting up two additional desalination plants within a distance of 600 metres in addition to bringing up the significant issue of beach erosion which has plagued Nemmeli since the first plant was inaugurated in 2013. The EAC has deferred the project for want of information and has called for fresh studies to understand the impact of shoreline change in the area. 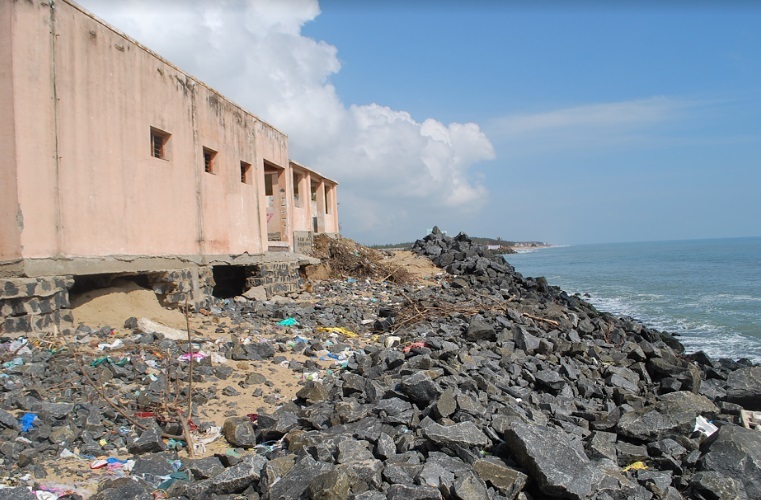 It has also sought recommendations of the Tamil Nadu Coastal Zone Management Authority (TNCZMA) in connection with certain relevant provisions of the CRZ notification 2011. Brine concentrate and effluent management are huge concerns the world over. Despite advancements made at developing “zero liquid discharge” technologies where the brine concentrate is converted into solids fit to be disposed at landfills, the costs remain prohibitive. Despite the heavy reliance on desalination, countries like Israel have invested heavily in securing their water sources and recycling used water. For example, Israel treats close to 85 percent of its wastewater which it then uses for irrigation, gardening and industrial purposes. Another crucial element is strengthening water supply infrastructure to prevent losses arising from transit leakages. Even officials at the Israeli Water Authority recognise that efforts at strengthening infrastructure and recycling wastewater should precede desalination. Options such as sewage and greywater recycling should be taken up in earnest to ease civic bodies’ water supply burden. Increased focus should be laid on caring for waterbodies; cascading tanks should be desilted and rejuvenated on a priority basis to save every drop of water before spending precious time and resources in extravagant options such as desalination. Israel 'hand-makes' more than 50% of its water!